Is there anything about the structure or content of the ma'amarim in Torah Or and Likkutei Torah that make them noticeably different from teachings contained in seforim from other Chassidic groups? Well, I’m a writer, not, by any stretch of the imagination, a mashpia, chassidic elder, or anything like that. Also, I don't know all that much about the teachings of other chassidic groups. But, if you want my take on the question, I'm willing to give it a shot. First, some general observations on the structure of Torah Or and Likkutei Torah. It’s said that the Alter Rebbe’s primary work of Chassidus, the Tanya, is the Torah SheBichsav of Chassidus, because it contains in seminal form everything there is to know. On the other hand, Torah Or and Likkutei Torah are considered the Torah SheBe’al Peh of Chassidus, because they expand and elaborate on—sometimes at great length—the ideas only alluded to in Tanya. Whereas the Alter Rebbe wrote the Tanya personally (taking great care over every single letter), the teachings in Torah Or and Likkutei Torah were delivered orally in the form of maamarim that were transcribed by several distinguished Chassidim (including the Alter Rebbe’s brother and the Alter Rebbe’s son and successor, the Mitteler Rebbe). 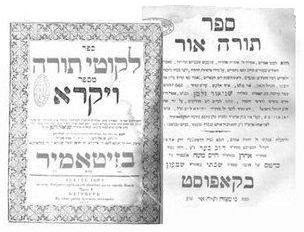 These maamarim were eventually edited by the Alter Rebbe’s grandson, the Tzemach Tzedek (the third Lubavitcher Rebbe)—who included some supplemental material at appropriate places in the text—and published as Torah Or and Likkutei Torah. (Torah Or covers Bereishis, Shmos, and Megillas Esther; Likkutei Torah covers Vayikra, Bamidbar, Devarim, and Shir HaShirim. The two works are essentially the same, and have different titles for reasons related to government censorship in contemporary Russia.) Lubavitch has always placed great stress on scholarship, and also believes that every little thing (including textual variations in manuscripts from authentic sources) is hashgachah pratis: the actual manuscripts of many of these transcriptions have been preserved in the archives over the years and have been published as the series Maamarei Admur HaZakein. Sometimes, you can actually compare a particular maamar as found in Torah Or or Likkutei Torah with versions of that same maamar (from various transcribers) found in Maamarei Admur HaZakein (or in other works such as the Tzemach Tzedek’s Or HaTorah), and gain greater insight into a point under discussion. However, it seems to me—although, as I said above, I am far from a “Chassidic scholar”—that the versions found in Torah Or and Likkutei Torah, edited for publication by the Tzemach Tzedek, are (as one might expect) the clearest and most concise formulation. Many of the maamarim of Chabad Rebbes throughout the generations have been extensions of, and based upon, the maamarim in Torah Or and Likkutei Torah, so that it is no exaggeration to characterize those works as being among the foundations of Chabad thought. The maamarim are usually based on the parshas hashavua (or the haftorah), and shed light on what is really going on; the underlying, esoteric explanation of incidents or mitzvos mentioned in the parshah. But they are by no means limited to a commentary on Chumash: in the course of the maamar, the Alter Rebbe frequently sheds that same illuminating light on things from all parts of the Torah—from statements in the Gemara to the deepest secrets of the Zohar. Overall, the effect is to open our eyes and penetrate our hearts and minds with the true essence of the Torah. For example, the maamar VeHinei Anachnu Me’almim Alumim in Parshas Vayeishev reveals the underlying symbolism of Yosef’s dreams by explaining in depth the Kabbalistic ideas of sheviras hakeilim—the “breaking of the vessels” of Olam HaTohu and their investiture within this world, Olam HaTikkun—and beirur nitzotzos—extracting, by means of mitzvah performance, the “sparks” of holiness found in this physical world and elevating them back to their spiritual source, thereby perfecting the universe and leading to the arrival of Mashiach. It is very satisfying to learn that maamar in conjunction with Parshas Vayeishev, but it can certainly be studied at any time throughout the year. Finally, I would observe—and I’m not sure whether this properly falls under “structure” or “content”—that some of the maamarim in Torah Or and Likkutei Torah may be described as oriented toward haskalah—appealing to our intellects and clarifying our understanding of spiritual concepts (like the ideas mentioned above from the maamar about Yosef’s dreams), while some may be described as oriented toward avodah—inspiring our hearts and bringing out the true ahavas and yiras Hashem that are inherent within every Jewish soul, making our davening and mitzvah performance incomparably more meaningful. Isarusa delesata/isarusa dele’eila — Our relationship with G-d is a two-way street. We are expected to initiate our relationship with Him through our own efforts at Torah and mitzvos (known as isarusa delesata—“arousal from below”); only then does Hashem respond by sending us inspiration that takes us to the next level (isarusa dele’eila—“arousal from above”). And this cycle repeats: on each level we find ourselves, we must strive to launch from there and draw closer to G-d, Who then responds with the Divine assistance that makes it possible. By contrast, if G-d has to wake us up from a state of spiritual slumber, so to speak, bestowing a sudden burst of inspiration upon us in order to get us going and motivate us to improve, the net result won’t be the same as it would have been the other way around; it will not produce any lasting effect unless WE do something to insure that. Overall, this preferred sequence of isarusa delesata followed by isarusa dele’eila is an instance of the more general spiritual dynamic of ratzo vashov, whereby G-d set up the universe to function according to a sort of spiritual pulsebeat, a kind of ebb and flow, or give and take. For example, before the redemption from Mitzrayim, the Jews experienced intensified suffering—because in order for there to have been the awesome transmission of spirituality that was manifest in connection with the geulah, there had to have been, first, a withdrawal of G-dliness, just as a great wave is preceded by receding of the seawater. Ve’ahavta eis Havayah Elokecha — The Divine name Havayah (the Tetragrammaton, the ineffable four-letter name of G-d) refers, in this particular context, to G-d as he is in Himself; the very Essence of G-d; utterly transcendent of creation. The name Elokim, by contrast, refers to G-d as He invests Himself within creation; G-d as he is accessible to us mortals. By rights, so to speak, G-d as Havayah is inaccessible to us; any possible conception or relationship we could have with G-d, no matter how spiritually rarified, is nevertheless grounded in our experience as souls within bodies here on this earth. It is impossible for a created entity to transcend that frame of reference. Nevertheless, if we strive with all our might to know and draw close to G-d through sincere worship and prayer, He responds to this isarusa delesata (see preceding paragraph) by impossibly, miraculously, making His very Self, so to speak — G-d as Havayah —accessible to us anyway: so much so that Havayah, the transcendent G-d Himself, will be Elokecha, your very own G-d, up close and personal, the G-d you relate to on an individual level even within the constraints of the world symbolized by the name Elokim. Correspondence between the heavenly realms and this world, and the fact that everything depends upon us — Another fundamental teaching running throughout Torah Or and Likkutei Torah is that the Jewish soul reflects the structure of the spiritual realms. Just as G-d manifests Himself in the universe in ten principle ways—the ten Sefiros—so do our souls contain ten levels corresponding to them. Furthermore, here is an important principle in Divine service: what we do down in this physical world—how we exercise and express our own character traits, the ten attributes of our souls—elicits a response in kind from G-d. This is how G-d wishes the universe to function, and He so thoroughly ingrained this rule in the spiritual infrastructure of the universe that we may think of it as, in a sense, “mechanical”: if we act a certain way, a certain heavenly consequence will result; if we act in another way, a different consequence will follow, and so on. Thus, what we do here in this physical world has ramifications all the way up the chain of spiritual realms, and ultimately taps into levels from which spiritual influence is drawn down to earth again. When we do a particular mitzvah, a particular spiritual effect is felt in heaven, and a corresponding spiritual response is drawn into the world. When we do a different mitzvah, a different specific effect is elicited, etc. What we do really counts; all of creation, even the highest spiritual heights, is sustained by the spirituality drawn forth through our Torah and avodah. Elevation of the sparks of holiness — As mentioned above, this physical world is the result of sheviras hakeilim—the “breaking of the vessels” of Olam HaTohu, the “Realm of Chaos” that preceded creation as we know it. Metaphorically speaking, the pieces of these broken vessels fell down and actually became the substance of this world, Olam HaTikkun, the “Realm of Repair.” What those “vessels” contained was the light of G-dliness, and, just as a broken piece of pottery will still contain some impression, some stain or residue, of its contents, so is there some residue of the Divine light still attached to the physical matter of this world. The reason mitzvos involve physical objects (tefillin made from cowhide, food eaten leshem Shamayim, etc.) is that, when we use those items to serve G-d, we are thereby liberating those trapped sparks and elevating them back to their spiritual source. Consider some cow, for example. I don’t know the life span of cows, but all the time a cow stands around in the pasture, munching grass and generally minding its own business, it is being sustained by the G-dly life force that is constantly renewed and keeps it from vanishing into utter nonexistence. If the cow lives and dies without ever being involved in a mitzvah, what was the purpose of that G-dly energy in this lowly world? But as soon as a Jew comes along and eats that kosher cow for mitzvah purposes—for example, for oneg Shabbos, or to learn and daven and do mitzvos with the energy from the food—it develops that the G-dly energy that had sustained the cow has now been converted into fuel for mitzvos, and rises heavenward with them. This is known as beirur nitzotzos—extracting the “sparks” of holiness. It is the perfection of the universe, the “repair” that takes place in Olam HaTikkun, and is one primary reason G-d created the world as we know it. There are a finite number of these “sparks,” and when they have all been successfully extracted, Mashiach will arrive. In fact, the Lubavitcher Rebbe said that now, the sparks HAVE all been elevated, and that Mashiach is actually arriving. Beautiful!! One of the most concise explanations I've ever seen. ASJ, what is you email adress? Rabbi Yitzchok Wagshul: the actual manuscripts of many of these transcriptions have been preserved in the archives over the years and have been published as the series Maamarei Admur HaZakein. This is just what I tried to find out for a while already. How do the mamymorim in Torah Or & Likkutei Torah correspond to the whole collection of "Maymorey Admur HaZokein"? What of them "intersect", what are unique here and there? The same question goes to mamorim in the sidur, which if I'm not mistaken were arranged by the son of Baal haTania - Reb Doyv Ber ztz"l.
It becomes pretty confusing. Did anyone ever made a reference with such information? Thank you Rabbi Wagshul.i have gotten such a beautiful clarity from your explanations and want to learn more. How can I purchase your translated versions?